MECCA, SAUDI ARABIA - Mansour al-Amer swipes a card to reveal a narrow sleep pod, reminiscent of Japan’s famed capsule hotels. But this pod is in Saudi Arabia, where the Muslim hajj pilgrimage began Sunday. The kingdom is introducing capsule rooms in the western city of Mina, as an estimated 2 million Muslim faithful gather for the six-day hajj, one of the five pillars of Islam. The free nap pods are part of new measures Saudi Arabia is rolling out this year in a bid to modernize the centuries-old practice of hajj. 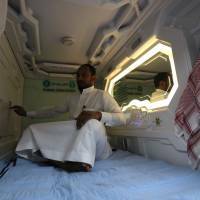 Al-Amer is the head of a Saudi charity, the Haji and Mutamer Gift Charitable Association, which is offering between 18 and 24 capsules for pilgrims to nap in for free in the coming days. Each fiberglass pod — less than 3 meters long and just over a meter high — features a mattress, clean sheets, air conditioning and a large, well-lit mirror. “We are always thinking about pilgrims and how to make them more comfortable during the rituals of hajj,” Al-Amer said. 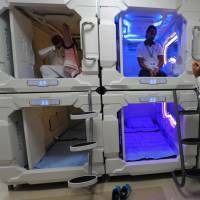 The nap pods provide a solution for pilgrims of limited means who cannot afford to book hotels on site but need a quick rest during hajj. Pilgrims will have three hours of access to the pods, which are imported from Japan at cost of just over $1,100 each. When the pilgrim wakes for prayer time — five times daily in Islam — workers will sterilize the pod before handing it over to the next pilgrim. But for hajj, which takes pilgrims across Mecca and Mina — two cities in western Saudi Arabia home to the holiest sites of Islam — the pods were also inspired by the rising popularity of car and bike sharing. “The capsules work through a share economy, like bicycles that you can rent for an hour and then leave for someone else,” said Al-Amer. A trial run of 12 pods earlier this year was, he said, a success. Al-Amer estimates 60 people used each pod every day during the holy fasting month of Ramadan. The hajj presents Saudi authorities with major logistical challenges, as Islam is currently the world’s fastest-growing religion, according to the Pew Research Center. Providing accommodation for 2 million pilgrims is no small feat, with travelers staying in everything from five-star hotels to tents pitched in empty lots. Saudi authorities are pushing a “smart hajj” initiative to meet with the growing demands of hajj, which coincide with the kingdom’s unprecedented modernization drive. Saudi Arabia, one of the world’s most restrictive countries, this year lifted a ban on women driving and has seen a string of reform initiatives spearheaded by the powerful young Crown Prince Mohammed bin Salman. But the kingdom has also tightened its grip on dissent, with around a dozen women’s rights campaigners arrested in recent weeks. Some have been released. The annual pilgrimage sees the Muslim faithful gather in Mecca, all clad in white, to perform rituals around the black Kaaba cube. The hajj also features a symbolic “stoning of the devil” ceremony, marking the start of Eid al-Adha, an Islamic holiday that started on Aug. 21 this year and will end Aug. 25. Eid al-Adha includes the slaughter of sheep, with the meat distributed to Muslims in need. The ritual symbolizes Abraham’s willingness to sacrifice his son, Ishmael, on the order of God.